When dry-aging you want to use large roast cuts (whole ribeyes, whole top sirloins, whole striploins, etc). Once they’ve been aged you can roast them whole, cut into smaller roasts or slice into steaks. At least four days before you’re planning on cooking your beef, unwrap it & dry off all the surface moisture. Move any foods that are pre-cooked or will be eaten raw away from the spot in your fridge where you’ll be aging the beef. This is simply an extra safety precaution to avoid any escaped beef juices contaminating other foods. Put the sheet pan or roasting pan on the bottom shelf of your refrigerator. Put the rack on top of it, then put your beef on top of the rack. Do not cover the beef. Age your beef. Flip the meat half-way through the aging process. 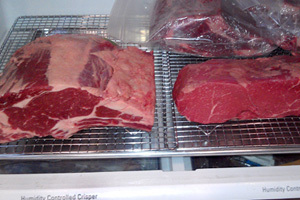 Once the beef has aged as long as you’d like, you can cover it with plastic wrap, cook immediately or freeze. Before cooking, trim off any partially dry/discolored portions of meat & fat on the surface and discard them.